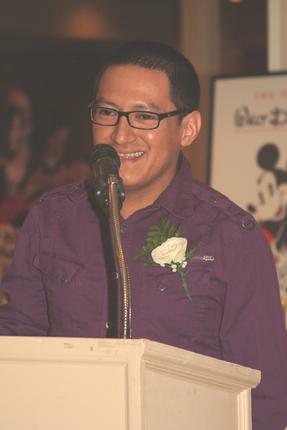 Elias Mayllazhungo came to the United States in 2011 at the age of 24 from Chontamarca, Ecuador. He and his two brothers and two sisters are of the Quechua, indigenous culture of which he is most proud. Elias has written stories about his life for class assignments and they have appeared in our newsletters. He has a deep admiration for his mother and grandmother. His father died when he was 2 years old. He thinks of his mother as a father because for 17 years and in Spain and the United States, she worked and sent money home to support her family. That left Elias and his siblings in the care of their grandmother who taught them many important lessons. She taught them to respect women and to work hard. Elias first came to One to One Learning a few weeks after he came into the country. He had a great start and because of perseverance, very good attendance, intelligence, and fine teachers, he has advanced into the pre-GED (high school equivalency) level. His present teachers, Barbara Bedway and Paul Parsekian open many avenues of learning to him. Elias has taken on the challenge of studying the math core curriculum on Tuesday evenings with Larry McKearney. Elias works in construction. So he is coming to class after a hard day of work. The only time he misses is when a job is out of town or goes late. One to One Learning proudly honors Elias Mayllazhungo with the 2016 Student Award for his spirit, perseverance, and love of learning.